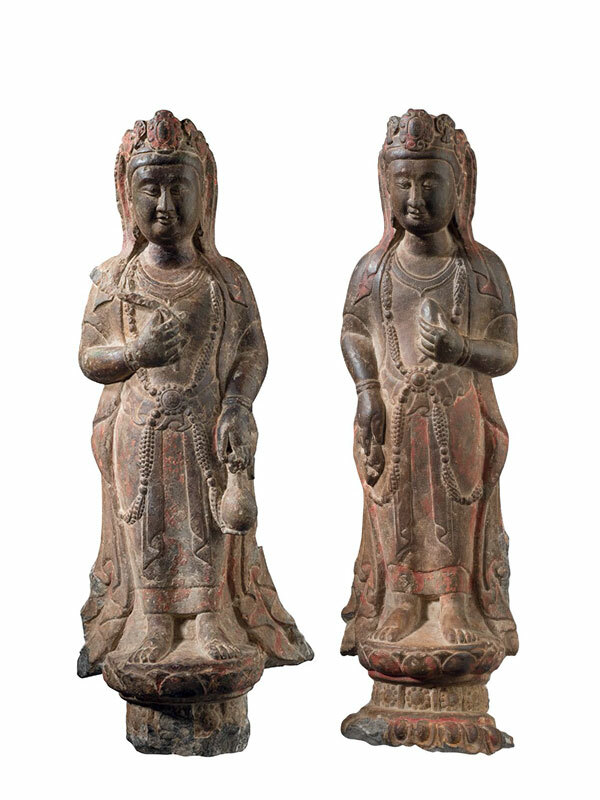 Two limestone sculptures of bodhisattvas, each standing on a tall, partly upturned lotus base. 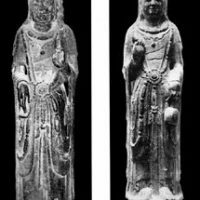 Both bodhisattvas are dressed in layered robes: the outer robe is loosely draped, falling into elaborate and rhythmic pleats on the shoulders and at the spreading hem; a belt is neatly tied and drops down into two long folds. A circular, disc-like necklace with a pointed end adorns their open chests. Another long necklace consisting of round and oblong beads is held together at the front with a beaded circular ornament. The head is crowned by an elaborate tiara, consisting of jewelled ornaments worked in the round, from some of which issue tassels. Each face has a benign, compassionate expression. The slightly rounded face has half-opened, downcast eyes, a strong, aquiline nose and a small, pursed mouth. The bare feet are revealed underneath the pleated hem. One bodhisattva has the right hand half-raised holding a branch of willow against his chest, whilst his left hand lower down holds a water vessel kundika. 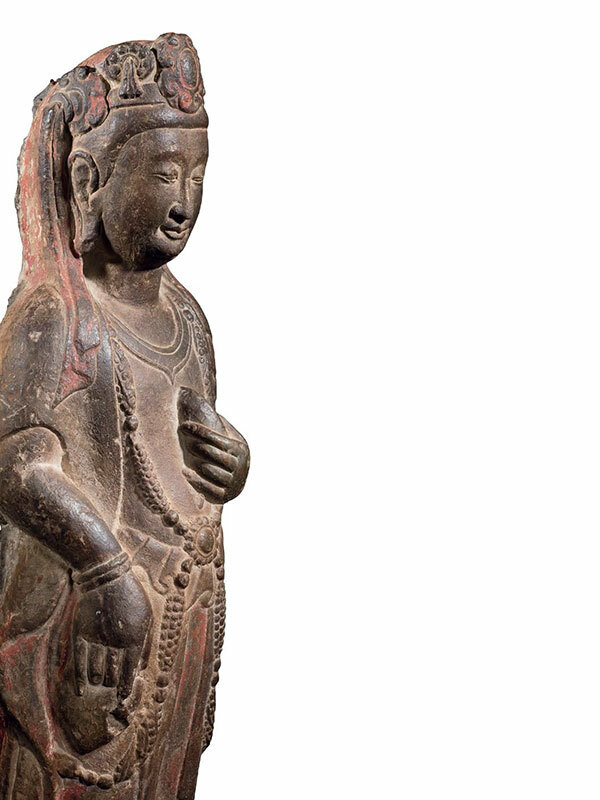 The other bodhisattva has an opposite arrangement in hand positions; his left hand holds a lotus bud and the right hand holds a purse-like attribute. The grey stone is uniformly coloured and bears traces of reddish pigment. Xiangtangshan Caves, literally meaning ‘Mountain of Echoing Halls’, were created near the Northern Qi capital, Yecheng (now Linzhang county, southern Hebei province) with official sponsorship.